VICIOUS Coyote Attack On Tiny Dog Starts To Go BAD- Then THIS Rottweiler Shows UP! If you need a story to help you feel better after a rough day or a rough week we might just have it for you. There is nothing like an underdog getting the best of a predator to make us feel like we can take on the world. And that is exactly what happens here. This tiny little puppy is attacked by a coyote and it doesn’t end like you would expect. Actual footage from a security camera is found below and shows the entire fight for the little dog’s life. Happy wasn’t having anything to do with his buddy becoming lunch. And the little dog was taking quite the beating. So he dashed across the yard, stirring up a cloud of dust, jumped into the fray, and chased away the wild animal. The last we see is Trixxie darting under a parked van and Happy finishing the job of booting the unwanted visitor off the property. Unfortunately, coyotes have been known to attack domestic animals. There are many reports of attacks on cats and dogs. The number of attacks continue to climb as humans get closer to invading habitats. 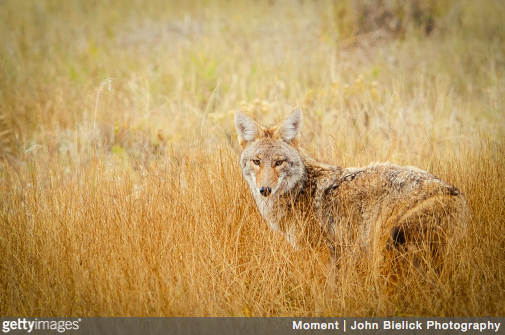 Coyotes are adapt quickly, and will go after whatever food is available. It saw an opportunity with the small dog. Thankfully, the neighbor’s dog Happy, saw the occurrence and intervened. Coyotes have been known to attack dogs as large as a Rottweiler before. That makes this event that much more incredible. It certainly is evidence that pet owners need to be aware of the threat predators present. They could be forced to come to a community near you. This video serves as a great reminder to keep an eye on your pets. It’s scary to think how quickly something like this can occur. We’re happy that Happy saved this particular day! Is this doesn’t make you feel a little better I do not know what will!